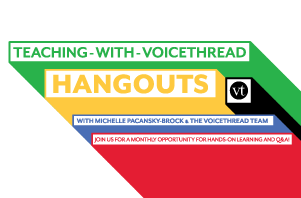 Each month, I host two events for VoiceThread's higher education community: a webinar and an online office hour. The events are geared towards showcasing effective practices of VoiceThread in college learning and providing assistance to educators who are teaching with VoiceThread (or want to learn how). Recently, we moved the office hour event to Google+ Hangouts! Many instructors struggle to understand how to use collaborative technologies to support large, lecture-based classes. In this webinar, you will learn how Ginger Shultz employs VoiceThread in an organic chemistry laboratory course that enrolls 350-850 students. Ginger will discuss how her use of VoiceThread has enabled her to foster greater community in her face-to-face classroom, as well as unveil the unique learner perspectives that often get lost in large classes. These outcomes allow Ginger to understand the flow of her students learning and make shifts in her instruction, as needed. college educators who have questions about how to teach with VoiceThread. Bring your questions and topics for discussion! unlimited number may view the streaming video on my blog here. To learn how to participate, click here.